Obviously, based on my previous blog posts, it’s apparent that I’ve been spending some time in the past few months testing VMware Site Recovery Manager and Zerto Virtual Replication to see which product best meets our business continuity and disaster recovery requirements. My task was to compare the two products, feature for feature based on our use cases, which are primarily protection, recovery, re-protection, and workload migration. As of today, SRM and Zerto have been tested in a sandbox environment, consisting of 2 sites (Seattle and Denver), 2 vCenters, 2 physical hosts in a cluster in each site, and 1 test workload which consisted of a Windows Server VM with auto-generated files of different sizes. The two sites, being geographically separated are joined by a dual 20 Gb/s connection, and there are no bandwidth throttling mechanisms in place outside of what’s available in the software, and it’s only used to throttle down during business hours. The physical networking at the host level in both sites is 10GbE. VMware’s Site Recovery Manager is the only one of the two products that has the array-based replication feature, so to make this more of an “apples-to-apples” comparison, that feature isn’t heavily reported on here, but has been tested, and it works well, so I’m happy. Both hypervisor-based product tests that were performed have been completed in each direction, in terms of recovery testing, failover, re-protection, and migration. The results of both solutions are similar, however, based on results, we are leaning more toward one product in terms of simplicity, flexibility, scalability, monitoring capabilities, and user experience. Below are images of what the topology for both test environments looks like, with SRM on the left, and Zerto on the right. ^^ Not pictured in the Zerto Diagram: External PSCs for vCenter, vCenter SQL Servers, and all port communication native to vCenter components. While VMware Site Recovery Manager creates a complete solution with vSphere Replication (which can also be used without SRM), Zerto also protects using hypervisor replication. But to compare the two, we must first compare the capabilities of each solution by comparing vSphere Replication (without SRM) to Zerto Virtual Replication. Note that without SRM, vSphere Replication can be rather limited when it comes to several features. The tables will lay out the use cases for either product, and their features. Version Compatibility vSphere Replication version must match vCenter version Zerto can be used with vSphere 4.0 and later, no ties to having every component match versions in respect to hypervisor/vCenter. Automated Recovery Capabilities Each VM in the recovery site will need to manually be powered on. Fully automated recovery capabilities. WAN Compression Network compression capable with 6.1 at the cost of vSphere replication appliance CPU resources. Note: 1 vR appliance per vCenter instance is supported for a maximum of 2000 VMs protected per appliance. Built-in, often seeing a 50% compression ratio. Replication appliances are assigned a 1:1 ratio (host to VRA) with automated resource reservations to ensure best performance of replication appliances. Non-Disruptive Testing Not available since you cannot power on the replica VM if the original VM is still running and reachable. Use SRM with vSphere Replication to allow for recovery testing. Real or bubble networks can be used for recovery testing and isolation. Cloning Capability None Allows for recovery site clones. This allows for full long-term archival backups of the VMs or file-level recovery from a point-in-time clone. 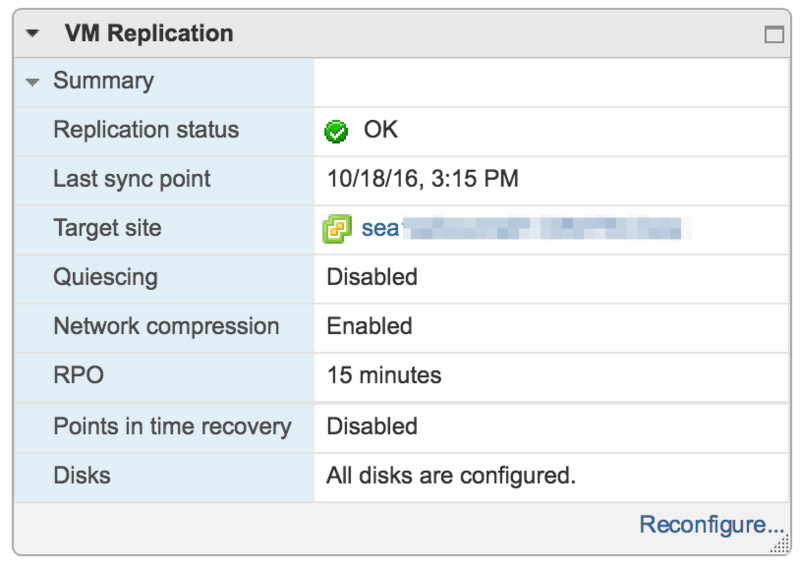 Point-in-Time Recovery Available with vSphere Replication 6.x - maximum of 24 PIT instances. Uses VMware Snapshots. Configurable, however, when using Offsite Backup Feature, up to 1 year. Does not use VMware Snapshots. RDM (Raw Device Mapping) Support No physical RDM support, but virtual RDMs are supported. Both physical and virtual mode RDMs are supported. 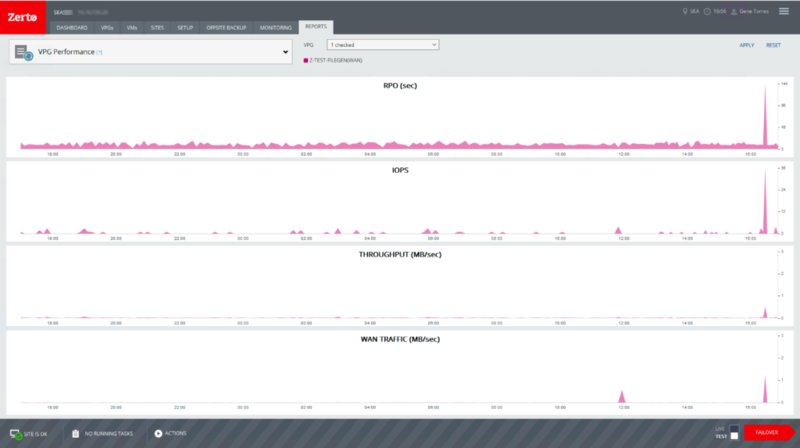 Bandwidth Control None Throttling and priorities are available in Zerto to reduce bandwidth consumption during certain times, and unlimited at others, via schedule. vApp Support Not Supported Zerto leverages vApps to make administration easier. If a vApp is configured for protection with a VPG, then any VM added to the vApp is automatically protected. Storage DRS Support Not supported, SRM is required. Storage DRS is supported and works with Zerto. How VMs are Chosen Selected individually or through multi-selecting in the interface, but protection grouping is not available. VMs can be organized into Virtual Protection Groups. Replication recovery points: Yes, up to 24 snapshots Yes, up to 14 days with standard recovery, up to 1 year with extended recovery using the Offsite Backup feature. Compatibility: vSphere Replication works with ESX 5.x and above. SRM requires the same version of vCenter and SRM be installed at both sites. Zerto works with ESXi 4.0 U1 and above. Zerto can replicate between different versions of vCenter. Zerto can also protect and recover from vSphere to Hyper-V, Hyper-V to vSphere, and either virtualization platform to the cloud (AWS, Azure(Zerto v5.0)). The following table displays the availability, use cases, and capabilities of both the VMware Site Recovery Manager and Zerto Virtual Replication APIs for access, integration, and automation. Similar to vSphere API, uses web service that allows access to the API in Java C#, or any language that supports WSDL (Web Services Definition Language). REST APIs are available to automate virtual infrastructure, allowing for benefits of software defined replication and recovery. The following tables below outline system requirements for both VMware Site Recovery Manager and Zerto Virtual Replication. VMware vCenter 6.0 U2 in both protected and recovery sites. As long as protected and recovery sites meet minimum versions, cross-version protection and recovery is supported. Depends on SAN vendor and code level, availability, and support. vSphere Web Client - by default will match currently installed version that matches vCenter requirement for SRM. According to VMware, CPU and memory resources consumed by vSphere Replication on a host or guest OS is negligible. The numbers seen above are how the appliance is configured by default. 1 of these appliances needs to be deployed (via Zerto UI) to each host that will be protecting VMs in VPGs. DRS Affinity rules are created automatically by Zerto during the deployment process, so VRAs always stay on the hosts they are installed to. Site Recovery Manager 6.1 (see versions above for compatibility) or review VMware's product interoperability matrix for all version information. WAN - 7 (in addition to all vCenter related ports) See topology diagram for port listings. WAN - 3 (in addition to all vCenter related ports) - See topology diagram for port listings. The following table compares the high-level installation tasks/steps for VMware Site Recovery Manager and Zerto Virtual Replication. These steps assume necessary pre-requisites such as vCenter installation and firewall rules have been created. Please note, that SRM appears to have many more steps, because SRM supports both array-based replication, in addition to vSphere Replication. If you don’t use one or the other, these steps are dramatically decreased. In my test environment, both features have been tested, and because of that, SRM has more steps. Build SQL Server/leverage existing, or use embedded vPostgress db. Note: This requires a functional error-free vCenter/PSC infrastructure. PSCs should be in-sync with no errors. Test, validate, protect, test recovery, monitor, and alert. See Database requirements in the above table for explanation on sizing the DB and when to use an external SQL server. Build Virtual Protection Groups (the VPG configuration also includes recovery options such as re-IP or pre/post scripts). The following workflows have been created to illustrate the process involved in protecting virtual workloads using VMware Site Recovery Manager with vSphere Replication, and Zerto Virtual Replication. In the above images, SRM on the left, and Zerto on the right; visually, you can see that SRM clearly has many more steps performed in multiple places, compared to Zerto. Majority of the additional steps in the SRM protection workflow deal with the multiple layers where protection is configured via the vSphere Web Client for a single VM using vSphere Replication. On the right side (Zerto), you see that most of the steps (if not all) for protecting virtual workloads takes place at the top layer, which is the Zerto Virtual Manager UI. In SRM, protecting a single VM using vSphere Replication involves selecting the VM enabling vSphere Replication, going into Site Recovery, building a protection group and configuring it, followed by creating a recovery plan and configuring. The recovery plan portion of that is where customization such as boot priority and IP address changes are completed. In Zerto, protecting a single VM is as easy as logging into the ZVM UI, creating a VPG, and providing protection and recovery settings all within one wizard. The following workflows have been created to illustrate the process involved in recovering from a site failure using VMware Site Recovery Manager with vSphere Replication, and Zerto Virtual Replication. 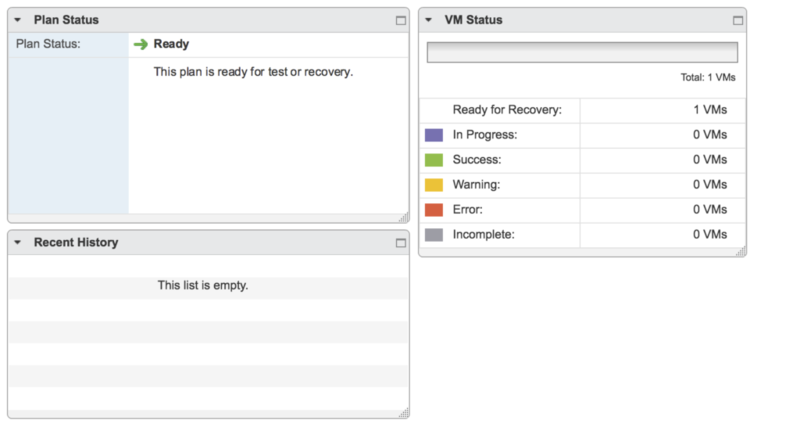 In the above images, SRM on the left, and Zerto on the right; visually you can see that the steps to recovery are fairly similar, with the exception that recovery in SRM is performed via the vSphere Web Client, while recovery from Zerto is performed from the ZVM UI (recovery performed at the recovery site in both scenarios). The most complex part about recovering in any scenario is the organization of admins/engineers/business stakeholders to recover, re-configure, and validate the recovery process. Of course, if routine recovery testing had been taking place, a failure should basically mimic a recovery test, although, more of a commitment at this point, instead of an exercise. In SRM, there really is one place to take care of a recovery, and that is in Site Recovery > Recovery Plans. Locate the recovery plan for the application(s) you want to recover, and click the red button – its a no-brainer! In the Zerto UI home screen, toggle the failover type from test to “live”, and click the recover button. When you click the button, you will be presented with a 3 step wizard, where you will select the VPG(s) to recover; select the checkpoint to recover from, set the commit policy, re-protect; and click the “start failover” button. Recovery and re-protection all in 1 place. The re-protection process in either product is straightforward, however, if there already isn’t a site built to re-protect to, there will be some work to do (in either case). Planning, designing, and implementing either of these two products shouldn’t be difficult for anyone, except there are several pre-requisites that take time, change management processes and schedules to follow, or firewall rules to create and verify. With SRM, I’ve found that since this product ties to closely in to vSphere and version matching is a requirement, this could delay anyone who doesn’t have a version-aligned environment; or doesn’t have experience with vSphere or SRM. The biggest requirement for SRM? vSphere – you will have to have a vSphere deployment fully functional, and at an exact minimum version in both sites, in order to deploy SRM successfully. Zerto doesn’t care if the vCenter/ESXi versions on both sites match, as long as the minimum supported version is in use. Granular requirements can make for administrative overhead and total team collaboration in the case of upgrades, maintenance, recovery, etc… because SRM relies heavily on version compatibility (as do other VMware products). In cases like this, there are specific orders of operations required for upgrades or power-on operations. These requirements are out of scope, but it pays to understand that they exist; so be sure to do some research, and if you can, test it before performing in production. When installing Zerto, what took the most amount of time was building the Windows VMs (a few hours x 2) to house ZVM in each site… that and firewall rules (about 2 weeks, in my case following approval, change management, and implementation). Once the VMs were built and the firewall rules were in place, the actual time taken to install Zerto was about 10-15 minutes per ZVM, and approximately 10 minutes to deploy each VRA, which can also be bulk scripted. Zerto works as long as the hypervisor and vCenter are at a minimum version supported by Zerto, but it can protect across versions, or even hypervisors (VMware vSphere & Microsoft Hyper-V)! VPG creation can vary, depending on how many VMs per VPG you want to protect, and customization of all options, with one of the longer taking items being recovery and test IP settings. That’s it. Once you have a VPG created, initial synchronization starts, and as soon as the sites are in sync, you’ll ready to test, recover, or migrate and re-protect. These reports can also be expanded to show more detail, and data range can be modified. In my experience during testing, monitoring replication status and information isn’t as intuitive and centrally located as you would expect. There are several different places to monitor protection status and get additional information. Some of this is at the VM level, where you will see replication status, last sync point, target site, quiescing (enabled/disabled), network compression (enabled/disabled), RPO, Points in time recovery (enabled/disabled), disk status. Selecting a protection group gives you a list of recovery plans, and VMs, and general protection information, but no logging or reporting. One more place that I was able to find monitoring and reporting is at the vSphere Replication level. Going to vSphere Replication in the vSphere Web Client, then clicking on a vCenter. From there, going to the Monitor tab, and clicking on vSphere Replication will take you the the screen in the image below where you can monitor Outgoing Replications, Incoming Replications, View Reports and Cloud Recovery Settings. The reports section looks to contain the most information, however, there isn’t a way in the UI to export reports if a customer requests a report to show history of their replication jobs. While this is great information, there is no way from the interface to export the reports if needed. This section contains general information on any replications to the cloud. Since we are not replicating to the public cloud, this section is empty, but I have shown it to display what detail it contains. Based on the findings for monitoring vSphere Replication and SRM, as shown above, there are multiple places to look for information, statistics, and reports. The problem here is that monitoring any ongoing replication jobs and/or recoveries and performance is a multi-tiered approach, and there is no centralization of information that is exportable for review. There are too many places to look for information, and it would be too tedious to effectively monitor protection jobs, recoveries, and performance out-of-the-box. Monitoring protection status in Zerto has been intuitive, detailed, and centralized. Zerto has decided to separate the two functions into “tabs” within the UI. One tab for monitoring (includes tasks and alerts), and one tab for reporting. The ability to set Zerto up to alert via e-mail and send reports at a regular interval (and scheduled!) are natively built into the product. The product doesn’t stop with 1 e-mail address destination, as it also allows for multiple recipients via comma or semicolon separator in the site settings. 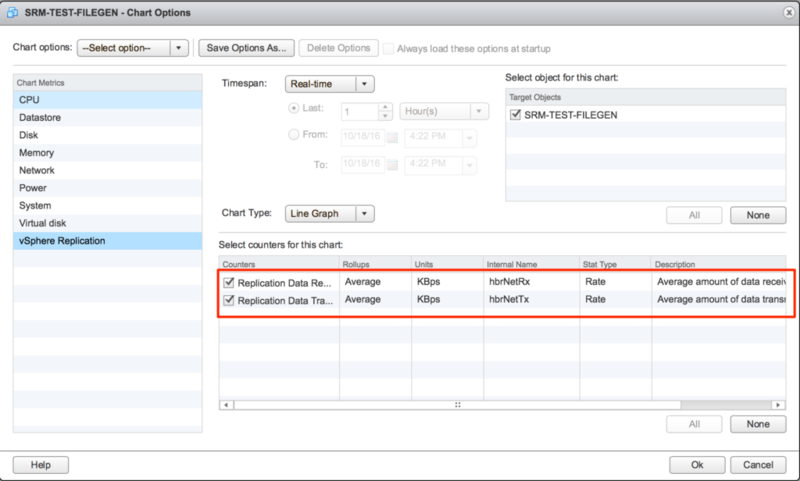 In the resource reports, you can set up the sampling rate, and the sampling time interval. In terms of BC/DR solutions, it would be much more preferred to receive more information than necessary, rather than waiting for a problem to surface. Nothing is more embarrassing or resume-generating than finding out at the point of a failure that your replication product hasn’t been replicating much or hasn’t been able to meet your RPO/RTO. 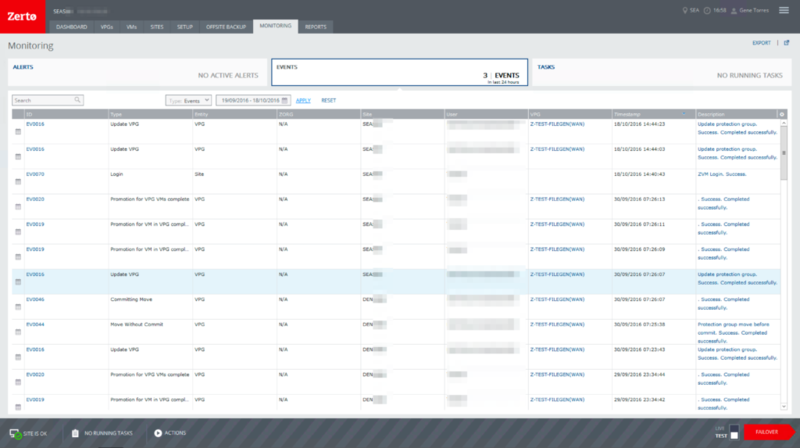 In the Zerto UI, monitoring alerts, events, and tasks is as simple as clicking on the “monitoring” tab. You can search for specific events or alerts (or both), and also modify the timeframe that you are targeting. In the reporting tab, you can get reports for the following items, and you can select any of them per VPG, or for all VPGs (and customize the reporting dates). In conclusion, both products work as advertised, and deciding which product to go with may come down to trust, flexibility, simplicity, scalability, monitoring & reporting, re-protection capabilities, and of course, cost. When considering the cost of either solution, be sure to also include the cost of human hours required to successfully deploy and support either one. Both products have their benefits and quirks, but the bottom line is that THEY BOTH WORK GREAT! Since I also went through the entire process from design to implementation, to protection, testing, and recovery – it took a considerable amount of time for VMware Site Recovery Manager to become usable due to some external problems we were having, so that sort of left a bad taste in my mouth (it was frustrating – but that was specific to my environment). Because Zerto wasn’t affected by those existing problems in terms of being prevented from working, it felt much simpler, but don’t get me wrong, you still have to plan for your deployment. The time that it took to deploy and have both products functioning varied considerably, with Zerto coming in as the winner in terms of time to protection versus Site Recovery Manager in my experience (again related to the underlying problems in my environment). Array-based replication is an optional feature of SRM, and once we figured out what was needed on the SAN side for this to work properly, it actually runs nicely. This method has historically an expensive route to go due to the requirement of needing to have the same storage (vendor at least) in each site (protected and recovery). This also introduces another layer of complexity in configuration, administration, maintenance, and support alignment, which will involve SAN administrators. vSphere Replication, on the other hand, is easy to set up and you can be replicating VMs using this method in a short period of time. Scalability of the products is another area I researched and determined that both products can protect up to 5000 VMs per vCenter instance (refer to comparison tables). Zerto can scale out to take advantage of cluster resources by deploying a VRA (virtual replication appliance) to each host in a cluster where you are protecting VMs. The VRAs come at no additional cost (both products are licensed per VM being protected) and can be sized as needed for best performance. When deploying Zerto VRAs, you will need IP addresses, so that’s one downside to having one per host, especially in large environments. On the plus side, you can deploy all those VRAs from one screen and their deployments can be automated, so that saves time. Compatibility of each product and their requirements vary as well, with SRM having more requirements in both sites (protected and recovery). Since Zerto is basically deployed on top of a virtualization infrastructure, it is not tightly integrated into the base vSphere product nor does it rely on the same version requirements as SRM. Zerto is very flexible in versioning for both protected and recovery sites, and it also can protect and recovery to/from vSphere and Microsoft Hyper-V, or cloud providers. Lastly, while I’m not seasoned programmer or script guru – at a high-level, both products can be programmatically managed, and both support PowerShell (with SRM requiring the PowerCLI add-on from VMware). Both products can also leverage vRealize Orchestrator, allowing workflow automation for protection tasks. Both products include support for multiple scripting/programming languages and have their APIs documented, however, in the case of SRM, the creation of recovery plans and forced-failovers cannot be automated (per the API documentation). Zerto can be managed through a feature-rich RESTful API that allows management of pretty much every aspect of the product and its capabilities, and their documentation is clear and full of example scripts in each of their supported languages for everyday tasks. I hope this information has been helpful for those who are trying to decide which product to go with, and as always, comments or questions are welcome! And if you find this to be useful information, please share it! In the interests of a fair comparison I could not help but notice that in multiple places in this article the SRM side of the story seems to be have deliberately broken out into overly verbose steps which actually include many optional steps. The installation comparison table is a perfect example. In the interests of fairness it is worth saying that SRM comes with an embedded vPostgres db which most customers use today. External database support is still there but the install can be simplified using the embedded database. So step 2 is optional. Also if we are combining the dual site build out for Zerto ZVM into a single line (step 1) then why split this out into 4+ steps for SRM? Surely for SRM you could have reduced those 4+ steps to “Build windows VMs to host SRM server in each site”? It is odd how you specifically call out that SRM sites need to be connected (a one time task) but no mention is made of pairing Zerto appliances across the sites? How do they sync up? Also you add a step for the SRM install process specifically to call out connecting to the client basically the UI but no mention of doing that for Zerto surely you logged into Zerto at some point to set things up? I would suggest SRM install steps can be broken down as follows if you are going to document them in same concise way you have Zerto and even then step 5a/b could be a single step if needed depending on replication option chosen. note: vm mapping and pre/post power on steps are also optional btw in SRM. Hi Lee, thanks for your feedback. I’ve been meaning to get back to this and perform edits, so finally go around to it. You make excellent points (that I’ve implemented), and I appreciate the response! For just replicating vms between datacenters to move them – what would you recommend? it really depends on how many workloads you want to migrate. If it’s a handful, then maybe I’d say go with something that you may already have, like vSphere replication (assuming you’re not using Hyper-V). If you’re going cross platform or moving an entire cluster or Datacenter’s worth of VMs, Zerto for simplicity and because it doesn’t take longer to install and configure, nor does it require the same version of vSphere in both Datacenter’s. Re-IPing or even rolling back is easy and automated as well. Licenses are also re-usable, so no worry there. How many VMs can be protected with RPO with seconds using zerto. What is the bottleneck for VR to have minimum 5 minute RPO where as zerto is providing seconds RPO? How the two products replicate data and the mechanisms in place that dictate RPO are two different things, so it would be hard to say what the bottleneck would be for VR with a 5 minute RPO, other than from what I understand about it, that setting (5 minutes – which depends on file systems on both source and target site – see here) is a schedule in which VR will attempt to replicate, which is subject to data change rate. Zerto uses continuous replication, using a journal and checkpoints, which are automatically created. You can also manually insert a checkpoint. Most automatic checkpoints are within seconds of each other and act as points in time in which you can recover the VM to or even restore a copy of a file from. One bottleneck that I can see though that would affect either product and their respective RPO times would be network bandwidth and whether or not compression is enabled. I’ve seen a misconfiguration lead to an RPO time for an Exchange server being almost 72 hours (quickly resolved after correcting that misconfiguration, which happened to be a severe bandwidth throttle setting). Once fixed, and caught back up, RPO returned to being less than 10 seconds. Hi Gene, just curious: what were you using to auto-generate test files in order to have data to replicate? How complicated was it to set up? I valued the time you took to publish this valuable post. offer other people what I have learned from you.